Indeed, Star Trek fans, the answer that's eluded us is finally here: Andorian chest hair is as white as fresh snowfall. 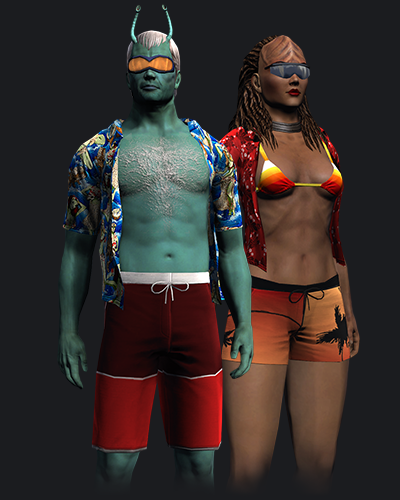 Now, you could go back to your business, or you could stick around Star Trek Online between today and July 16th, as the game runs its yearly summer event, taking place on the beach resort planet of Risa. As with the last couple of years, the event area features a rotating cycle of mini-games, like races, scavenger hunts, and an aerial obstacle course, that players can participate in to earn rewards. The rewards include tacky swimwear, jetpacks, futuristic surfboards (including a new one honoring the late Mr. Spock), the Trek version of an Evee, and even some gear that might actually useful in the rest of the game, like a "Hurricane Generator", which is something I figure would be more appropriate to whip out in front of one's enemies rather than in the middle of a seaside dance party. And of course, there's a fancy starship up for grabs, as well. Players who participate in the event for 25 of its 42-day runtime will unlock the Nandi-class warship, a new playable starship patterned after the Ferengi D'kora-class cruiser. It's the first full-size Ferengi vessel made available since the D'kora appeared in-game in 2012, so latinum-lovers seeking the full "armed merchantman" experience may want to give it a look.